Which part of the country is getting richer the fastest? That might seem like a strange question in the middle of a four-year economic stagnation. Chronic unemployment continues, and the American workforce participation rate remains at 35-year lows. The US economy has not added more than 250,000 jobs in a month since February, and only twice since February 2012. Nearly a million people (932,000) left the workforce in last month’s jobs report, and over 3 million in the past year, according to the Bureau of Labor Statistics’ Household Survey. Economic growth remains mired in the 2-3 percent range, with incremental gains giving way almost immediately to incremental setbacks. What boom? It’s not an economic boom, but a deluge of federal spending that “transformed the culture of a once staid capital and created a new wave of well-heeled insiders.” In other words, the “boom” is in part a transfer of wealth through taxation from everywhere else in the nation to the capital, and in part a borrowing spree that fuels federal spending and the lobbying and consulting industries that both benefit from it and bend it to their own interests – at the expense of economic growth everywhere else. This trend has proceeded for some time. 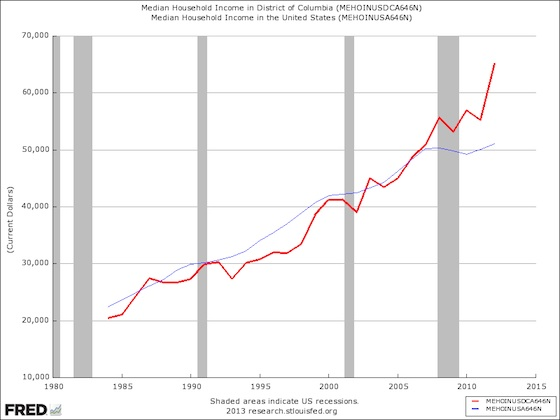 A chart from the Federal Reserve of St. Louis shows the dramatic gap that has opened up between Washington D.C. and the rest of the country in median household income. Ironically, this trend has become noticeable at the same time that Hollywood has launched the second of a planned trilogy of films based on the young-adult book series The Hunger Games. The dystopian tale takes place in a future where America has been superseded by a country called Panem, whose capital soaks up all of the wealth and forces its impoverished districts to contribute children for gladiatorial combat to amuse the wealthy elite and intimidate everyone else into submission. Even more ironically, the city itself exemplifies both ends of that dynamic. While the local economy has soared, its poverty has not abated. National Journal notes in its own report on the link between its increasing wealth and federal spending that the District of Columbia would rank second-worst in food insecurity among children when compared to the rest of the states. "It's surprising to come to my hometown and to see the level of hunger here that is extremely real," Capital Area Food Bank CEO Nancy Roman told Nancy Cook. The Beltway is still a long way from being the Capitol of The Hunger Games, but that doesn’t make the economic drift from the mainstream of the nation and Washington’s aggregation of resources and power any less disturbing. If it resulted in wise and beneficent policy, it might at least be understandable or tolerable. However, as the unfolding disaster of the Affordable Care Act demonstrates, the trend instead feeds a poisonous combination of elitism and incompetence while protecting politicians from the consequences of failure. The nadir of that incompetence emerged in surprising testimony on Tuesday from a key figure in the Health and Human Services project for the ACA’s web portal. CMS Deputy Chief Information Officer Henry Chao, under questioning from Rep. Cory Gardner (R-CO) in a House Energy and Commerce Committee hearing, stated that 30 percent to 40 percent of the ACA’s computer infrastructure had yet to be built. Specifically, the systems that had yet even to be started were those that will eventually process the payments of taxpayer subsidies to insurance companies that result from enrollments at Healthcare.gov. That leaves a big question as to whether anyone has effectively enrolled in insurance plans through the ACA’s web portal. After all, insurance doesn’t take effect until full payment has been made for the first month’s coverage, which has to be received by the middle of the previous month. Enrollees will pay insurers for their portion of the premiums, but whether the plans will take effect without the subsidies is anyone’s guess. The back-end functions for subsidy payment haven’t been completed, while those payments would have to go out no later than seven weeks from now. Even if the systems were completed today, that leaves almost no time for testing – and if the back end is anything like Healthcare.gov’s front end, it will need a tremendous amount of testing to keep the payment systems from complete failure on launch. At the same time that Chao surprised Congress with his testimony, other analysts told Congress that the web portal was so dangerous to consumer data safety that it should be abandoned. Four data-security experts unanimously agreed that the site was not secure in its present state during questioning by the House Science, Space and Technology Committee. Three of them agreed with Rep. Chris Collins (R-NY) that the site should be shut down until the security gaps were fixed. The fourth, Avi Rubin of Johns Hopkins University, told Reuters, “Bringing down the site is a very drastic response.” On the other hand, Rubin also said he wouldn’t use it in its present state, either. Douglas Kennedy, a former Marine Corps cyber-intelligence analyst, submitted written testimony that estimated the time needed to repair all of the security gaps in the HHS system would be seven to twelve months – if the site was taken down immediately. Bear in mind that this isn’t exotic, new technology. Commercial web portals have been around for almost twenty years. CMS actually has a similar system in place for its Medicare Advantage program, although one that doesn’t need to interface with IRS systems. And yet, after more than three years and hundreds of millions of dollars, HHS and the White House rolled out a system that is only 60-70 percent finished, with so many security holes that experts would need as much as another year to plug them all. We may not be living in The Hunger Games, but we are seeing a demonstration of the inevitable result of elitism and central planning. We aren’t sacrificing our children for the amusement of the powerful, but we are sacrificing our resources to the incompetence of the self-appointed nannies that can’t even figure out the basic economics of risk pools or the mechanics of payment systems. It’s time to pull the plug on DC’s cash spigot and return to local control and private-sector solutions. * Obama’s Second Term: Worse Than George W. Bush’s?